Check GST health for any business in one Click! The demand under GST and recovery provisions will be initiated if there is a failure to pay the tax, in a manner similar to the provisions of current tax. When can a Demand Under GST be Raised by the Tax Authorities? The Goods and Service Tax is payable on a self-assessment basis. If the assessee pays the tax on self-assessment correctly then there will not be any problem. If there is any short payment or wrong utilisation of input credit, then the GST authorities will initiate demand and recovery provisions against the assessee. Provisions of demand under GST Act and the consequent recovery provisions are similar to the provisions of Service Tax and Central Excise Act. ——for any reason, other than fraud etc. i.e., there is no motive to evade tax. The proper officer (i.e., GST authorities) will serve a show cause notice on the taxpayer. They will be required to pay the amount due, along with interest and penalty. The proper officer is required to issue the show cause notice 3 months before the time limit. The maximum time limit for the order of payment is 3 years from the due date for filing of annual return for the year to which the amount relates. Once the above notice has been issued, the proper officer can serve a statement, with details of any unpaid tax/wrong refund etc. for other periods not covered in the notice. A separate notice does not have to be issued for each tax period. A person can pay tax along with interest, based on his own calculations (or the officer’s calculations), before the notice/statement is issued and inform the officer in writing of the same. The officer will not issue any notice in this case. However, if the officer finds that there is short payment, they can issue a notice for the balance amount. 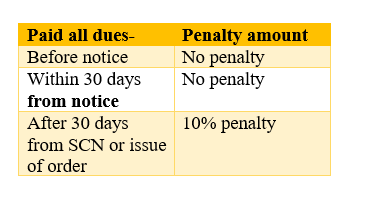 If the taxpayer pays all their dues within 30 days from date of notice, then the penalty will not be applicable. All proceedings (excluding proceedings u/s 132,i.e., prosecution) regarding the notice will be closed. The tax officer will consider the taxpayer’s representation and then calculate interest and penalty. Penalty will be 10% of tax subject to a minimum of Rs. 10,000. The tax officer will issue an order within three years from the due date for filing of relevant annual return. Latest update: However, penalty (10%) will be still payable where any self-assessed tax etc. has not been paid within thirty days from the due date of payment of the tax. The penalty will be applicable irrespective of whether or not the taxpayer pays before or after SCN. If he is paying 30 days after due date of payment, he will be liable to pay 10% penalty. This is a rather harsh provision considering GST is completely new and there will be many taxpayers making genuine mistakes. Taxpayers will be penalised for making genuine errors. In such cases, the proper officer will serve a show cause notice to the taxpayer. They will be required to pay the amount due along with interest and penalty. For cases of fraud, the proper officer is required to issue the notice 6 months before the time limit. The maximum time limit is 5 years from the due date for filing of annual return for the year to which the amount relates. If the person pays tax along with interest and a 15% penalty based on their own calculations (or the officer’s calculations) before the notice/statement is issued and informs the officer in writing, then the officer will not issue any notice. If the taxpayer pays all their dues and a penalty of 25% within 30 days from the date of the notice, then all proceedings (excluding proceedings u/s 132,i.e., prosecution)regarding the notice will be closed. The tax officer will consider the taxpayer’s representation and then calculate interest and penalty and issue an order. The order must be issued within five years from the due date for filing of the relevant annual return. [For wrong refunds the order must be issued within five years from the date of the wrong refund]. If the taxpayer pays all their dues and a penalty of 50% within 30 days from the date of order, then all proceedings (including prosecution) regarding the notice will be closed. If the service of notice or issue of the order has been stayed by a Tribunal/Court order then the stay period will be excluded from the time limits of 3 and 5 years. If the Appellate Authority/Tribunal/Court decides that charges of fraud are not sustainable (i.e., it is not a fraud case), then the notice issued earlier will be assumed to be a notice u/s 73 (i.e. non-fraud case). The tax officer will calculate the tax accordingly. If the Tribunal/Court directs that an order has to be passed, then it will be issued within two years from the date of the direction. An opportunity of a personal hearing will be given to the taxpayer when they request it in writing OR a penalty or any adverse decision is proposed against such person. The proper officer can adjourn the personal hearing if the person provides sufficient cause in writing. But adjournment will be allowed for a maximum of 3 times. The amount of tax, interest and penalty demanded in the order will not exceed the amount specified in the notice. All demands will be only on grounds specified in the notice. The Appellate Authority/Tribunal/Court can modify the amount of tax determined by the officer. Interest unpaid/short paid tax will have to be paid whether or not specified in the order. If the order is not issued within 3 or 5 years then it is assumed that the adjudication proceedings are completed. No order will be issued afterwards. Pending cases where the decision was against the interest of revenue might be appealed to a higher authority. For these, the period between the date of the decision (aggrieved order) and the date of appeal decision of higher authority) will be excluded from the period of 3/5 years. Recovery provisions for unpaid/short paid tax and interest is applicable irrespective of demand provisions. Penalty u/s 122 is not applicable in these cases. Once any penalty is imposed under section 73 or 74, then no penalty under any of the GST sections is applicable. Only the penalty u/s 73 and 74 will be applicable. Other penalties u/s 122 will not be applicable in these 3 cases. However, charges for offences u/s 132 facing prosecution will not be dropped. ClearTax has an All-in-one GST kit specially designed for CAs. Please also feel free to read our articles and watch our videos.